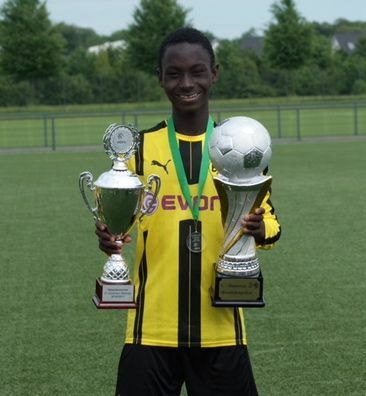 Lamin Touray, Borussia Dortmund´s Gambian born youth player has been celebrated and awarded best German U15 player in the 2016/17 footballing season, after helping his team win both the U15 league and the supper cup. His team emerged top in the German U15 league, in which Lamin was so influential, he also help the team beat Preußen Münster by 3:1 in the U15 supper cup final. Lamin, 14, a son to Gambian parents was born in Basse Dambpa Kunda, later moved with his parents to Dortmund, Deutschland at the age of 4, where he is residing. The young proflic left attacker, who puts on the number 19 jersey, joined the Dortmund youth two years ago and since then emerged as a regular starter. He have scored 8 goals and provided numerious of assists in the last football campaign as Dortmund U15 player. A top football official in Dortmund, close to Lamin and his family, discribes him as a star in the making. “He gets a great potential and if given the necessary support, he could be a great player in the near future,” he said. In his two-year stint with Dortmund youth team, he played against other teams in Europe and he is scoring and providing assists to his teammates, he is just a fantastic player, the official added. Speaking to this reporter, Lamin said he is very happy and feeled honored to win such an important award in his life. “I am very happy to win this award, [I] am commending the management of Dortmund, my teammates and family for the support rendered to me in my two year stint in the youth team,” he said. Reacting to Marco Reus´ comparission, the lad said: “when I play, my friends and other people say to me that I play like Reus. [I] am not trying to copy his style of play but rather playing my own way and trying to be myself,” he said. But that does not stop him to voice out his admiration to France international Ousman Dambele as his star player. Asked about Gambian football, he said he does not know much about Gambian football now, but his future dream is to represent the tiny country in major competitions like African Cup of Nations and World Cup. Lamin does not only play football but he is also a Grade 8 student at a secondary school in Dortmund, and he speaks fluent Mandinka and Deutsch.